Think about the last food you ate. Maybe it was a meal or maybe you’re snacking on something right now. Have you ever considered the amount of effort that has gone into plant and animal breeding to produce that food? The wheat that was ground into flour for your bread, the latest variety of apple, and the milk you’ve added to your coffee—even the coffee itself—have all been made possible through scientists improving crops and animals to produce more and withstand a wider range of weather conditions, pests and diseases. The Green Revolution in India refers to a period when Indian agriculture was converted into an industrial system due to the adoption of modern methods and technology. This was part of the larger Green revolution endeavor initiated by Norman Borlaug, which leveraged agricultural research and technology to increase agricultural productivity in the developing world. These plant and animal breeders are unsung heroes of our day. Although there have been criticisms lodged against the Green Revolution and its outcomes, it’s widely acknowledged that scientists such as M.S. Swaminathan and Norman Borlaug helped saved millions of lives through new varieties during India’s Green Revolution. We are now facing a similar challenge of increasing the level of food production because of a growing population and shifting diets under the pressures brought by shifting weather patterns and a changing climate. How can plant breeders help us this time? Read the workshop report here. A small group of scientists from a mix of CGIAR Centers who work on anticipating future changes in agriculture met at Bioversity International’s headquarters in Italy to discuss how we can help breeders anticipate possible future needs and provide information to help them prioritize their efforts to meet those needs. Data: Scientists could have a better idea of what kind of traits they need to breed into specific crops if climate model data can be improved in terms of variability, spatial and temporal appropriateness and future environments. Methods: More work can be done to learn from sites that are similar to each other in terms of climate, soils and farming systems and sites that currently experience climatic conditions that may be experienced in other sites in the future. Such sites or “homologues” can be used by breeders to select for particular traits and to test new varieties and other interventions under the climatic conditions that are expected in the future rather than those of today. Knowledge: There are advances in how to capture the future trait preferences of different stakeholders. Tim Byrne, of Abacus Bio, gave a presentation to the group which demonstrated an example of how farmers’ preferences can be assessed using a software that can help understand tradeoffs between different traits and what types of traits different types of farmers prefer. This can help breeders know what farmers want and need. Behavior: We can gain a broader picture of how to improve breeding programs if people from different disciplines and sectors are involved. Bringing together breeders, economists, private seed companies and farmer representatives can enrich the work of breeding programs by capturing more perspectives on the importance of different aspects of crop varieties. Future uncertainties: As agricultural systems are shifting in response to changing markets and other drivers, scientists need to understand the evolution pathways of small-scale farmer development. Different regions will have different pathways and these are currently uncertain. There are also large uncertainties over the possible roles of new technology that is on the horizon. Who should be the main focus in terms of next users for CGIAR technologies/varieties? Small-scale farmers? Mid- to large-scale farmers who have the ability to adopt new varieties and practices? How should CGIAR deal with dietary change? Should the mandate shift to include the focus on overnutrition, given the dual burden of malnutrition now being experienced in more and more developing countries? 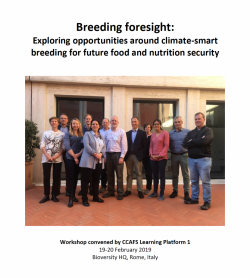 Should CGIAR Centers consider new technologies that have not historically been part of their mandate crops, e.g., insects for alternative proteins or algae as alternative livestock feeds? Given the rate of change of food systems and the urgency of addressing the Sustainable Development Goals, should we be re-thinking the possible future contributions of the Centers and the CGIAR system as a whole? There are no easy answers to these questions, but discussing and debating them within and across Centers can help CGIAR look toward the future and play a much-needed role in the adaptation of crops and livestock to the changing climate.